Moeen Munir Ali (born 18 June 1987) is an English international cricketer. He is a left-handed batsman and right-arm off-spinner who played county cricket for Warwickshire before moving to Worcestershire after the 2006 season. As of 2017, Ali represents England in all formats of the game. He won Warwickshire's NBC Denis Compton Award in both 2004 and 2005 and Worcestershire's NBC Denis Compton Award in 2009. His off-spin is marked by a strongly spun off-break and a well-concealed arm ball. He was named one of the Cricketers of the Year in the 2015 Wisden Cricketers' Almanack. Ali is a Muslim, of Pakistani descent, and was born in Birmingham. He belongs to the Mirpuri community; his grandfather migrated to England from Mirpur, Azad Kashmir. Ali's grandmother was Betty Cox, who was White British making him mixed-race. He can understand Urdu and Punjabi. He became known fondly as "the beard that's feared" at New Road. He made his debut for Worcestershire in their ten-wicket win over Loughborough UCCE on 25 April 2007, but had a rather poor game, returning 0–92 off 16 overs and being dismissed for 12 in his only innings. During the 2011 season Moeen spent three weeks as Worcestershire's acting captain while the usual club captain, Daryl Mitchell, was injured. Though he had captained England Under-19s, it was the first time he filled the role for his county. As he was inexperienced, Moeen approached senior players Vikram Solanki and Ben Scott for advice. After the departure of former England international Vikram Solanki at the end of the 2012 season Ali was handed a new 5-year contract. After performing well, including five consecutive 50s, Ali was called up to the England Lions where he scored 61 runs against Australia with many calling for him to be selected for the full side. 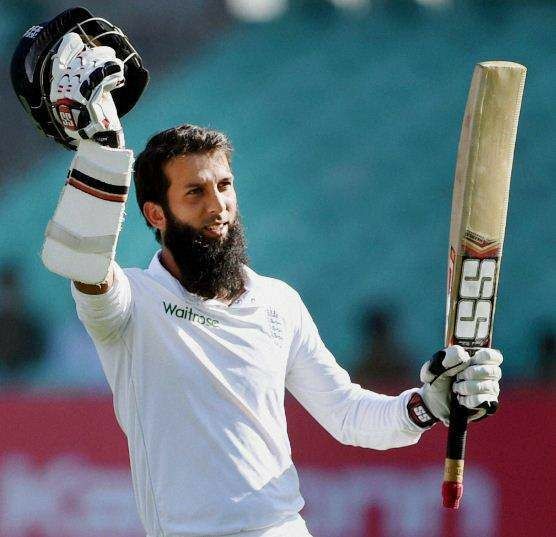 Moeen averaged 62 in Division 2, totalling 1375 runs altogether – the highest of any batsmen in first class cricket and finished with 4 centuries and 8 fiftys as well as 28 wickets. He was awarded county cricket's MVP award beating Samit Patel on the final day of the season and was also named PCA player of the year. Ali was also called up to the England development squad ahead of their Australian Ashes tour. Ali was included in the English Squad for the 2014 ICC World Twenty20 in Bangladesh. Before the tournament, the squad played the West Indies in a limited overs series, and Ali made his ODI debut against the West Indies on 28 February 2014. He scored 44 runs before being dismissed and took his maiden ODI wicket. In the second match he made ten runs and took figures of 1–11. Ali was again impressive in the third match, making his first half century in a score of 55. He ended up scoring 109 runs and picking up 3 wickets in the three match series. He made his T20 debut in the second match of the T20 series, although he scored just 3 runs and did not bowl. In the final match of the series he batted at 7 but was run out for 3 runs. Ali was a part of England's world T20 squad. He managed 49 runs in 4 matches and ending up wicketless. His tournament got off to a good start with him hitting 36 against New Zealand, and bowling 1 over for 7 runs. In the second game against Sri Lanka, he was dismissed for a first ball duck, although only four runs came of his over. Against South Africa he managed 10 runs and bowled two overs for 17 runs. He had a poor final match against the Netherlands, bowling 1 over 13 runs and being dismissed for just 3. In the first match of England's World Cup campaign against Australia, Ali made 10 with the bat and failed to take a wicket as England suffered a heavy defeat. He made 20 in the next match against New Zealand as England suffered a humiliating eight wicket defeat. He scored a century in the next match against Scotland, making 128 from 107 balls to help England to a score of 303. He also took two wickets in Scotland's innings as he earned the man of the match award. He was less effective against Sri Lanka, making just 15 and taking figures of 1–50 as England lost the game. This meant they had to beat Bangladesh to qualify for the Quarter finals, but they suffered defeat, with Ali making just 15 as England failed to chase down 275. 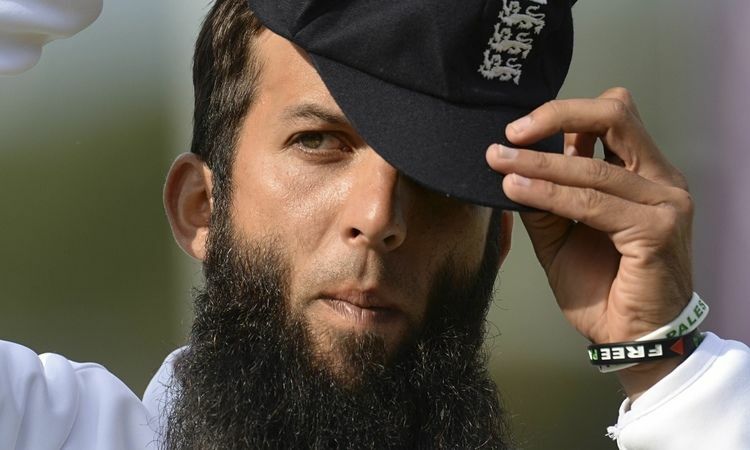 Injury ruled Ali out of the final game against Afghanistan, which England won. Due to his injury at the World Cup, Ali was not initially selected for the West Indies tour. However, after recovering, he was called up for the Second Test Match of the series. In the first innings, Ali took figures of 1–47, and was run out for a duck. In the West Indies' second innings his bowling figures were 3/51, and he was not required to bat in England's second innings as they went on to secure a nine wicket victory to lead the series 1–0. 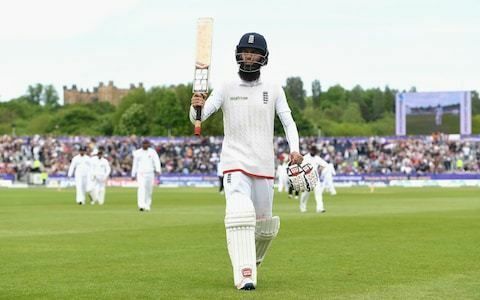 In the third Test Moeen made 58 in the first innings. However, he was disappointing with the ball, taking just one wicket. He made just eight in the second innings as England collapsed to post just 123. Moeen took 1–54 in the second innings as the West Indies won to level the series at 1–1. 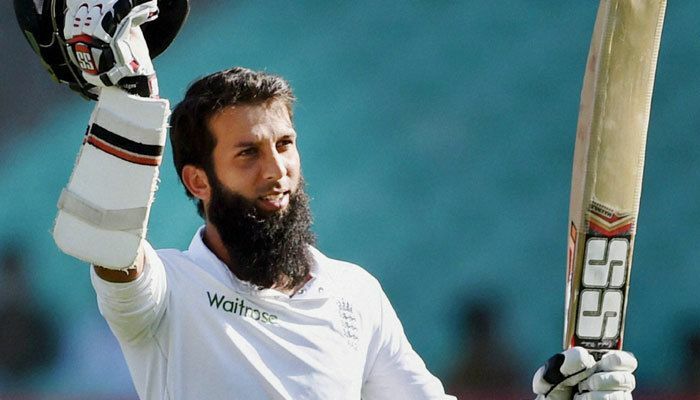 In the first Test against New Zealand, Moeen scored 58 in England first innings to help them fight back to post 389. He then took three wickets in New Zealand's innings. He again impressed with the bat, making 43 in England's second innings and taking a wicket in New Zealand's second innings to help England win by 124 runs. In the second Test Moeen was less impressive. He failed to take a wicket in New Zealand's first innings and was then dismissed for just one. He took a wicket in New Zealand's second innings but again failed with the bat as England lost the second Test to draw the series 1–1. Ali was selected in the England side for the 2015 Ashes series. In the first Test he scored 77 in England's first innings before taking two Australian first innings wickets. He then took 3–59 in Australia's second innings as England secured an opening win. Ali could only manage figures of 1–138 in Australia's first innings of the second Test and then managed 39 with the bat. He took 2–78 in Australia's second innings but England suffered a heavy defeat. He scored 38 runs in England's first innings of the third Test and then took 1–64 in Australia's Second innings as England won by 8 wickets. In the fourth Test he was again not needed to bowl in Australia's first innings but made 38 with the bat as England secured a victory by an innings and 78 runs to regain the Ashes. In Australia's first innings of the final Test he took 3–102 and then made scores of 30 and 35 and England lost by an innings but won the series 3–2. In the only T20 match between the two sides, Ali took figures of 1–3 and made an unbeaten 72 with the bat as he was named man of the match. In the ODI series against Australia, Ali made 17 in the first match, but England suffered a defeat. England also lost the next game, with Ali proving to be expensive and finishing with figures of 1–68. He took 3–32 in the next game to help England to their first win of the series, before taking 2–40 in the fourth match of the series to help England to a three wicket victory. In the final match of the series, England lost by 8 wickets, with Ali failing to make an impression with the bat or the ball. In the first Test against Pakistan, Ali struggled with the ball, conceding 121 runs in the first innings without taking a wicket, although he did take two wickets in the second innings. In his new role as opener, he made 35 with the bat in the first innings and 11 in the second as the match ended in a draw. In the first innings of the second Test, he took figures of 3–108, but again struggled with the bat, making scores of 1 in both innings as England slumped to defeat. He took 2–49 in Pakistan's first innings as they were dismissed for 234 in the third Test, although he only scores 36 runs in the match as England lost by 127 runs. Ali made little impact with the bat against Pakistan in the limited overs series, scoring just 13 runs, although he was only dismissed once. He took one wicket in each of the first three matches to help England into a 2–1 series lead with one game left to play. Ali’s best bowling performance came in the final game as he took 3–53 to help dismiss the hosts for 271 as England won by 84 runs. Ali also played in two of the T20Is, taking figures of 1–30 and 1–22. Although he was dismissed for a duck in both games he played in, England won both games. In the T20 World Cup, Ali took figures of 1–38 in the opening defeat against the West Indies. He took 2–34 against South Africa and 1–17 against Afghanistan. He also scored a crucial unbeaten 41 against Afghanistan to keep England’s hopes of progressing to the semi-finals alive.In that same match he along with David Willey set the record for the highest partnership for the 8th wicket in T20 World Cup history(57*) He took 1–10 against New Zealand as England won by 7 wickets to qualify for the final. However, England lost the final, with Ali being dismissed for a duck and not bowling any of his overs. Ali was included in the test squad for the series against Sri Lanka. He scored a duck in the first match, but in Sri Lanka's second innings he took a wicket in his first and only over. England won the match by an innings and 88 runs. In the second test at Chester-Le-Street, he scored his second Test century. He scored 155 not out, an innings which included 2 sixes, helping England reach a score of 498–9. He took one wicket in the match, as England won by nine wickets. In the first ODI against Sri Lanka, Ali took figures of 1–69 as the match ended in a tie. In the second ODI, he didn't pick up a wicket and was not required to bat as England won by ten wickets. He didn't play in the third ODI, but returned in the fourth ODI and took figures of 0–58 as Sri Lanka posted 248/9. He opened the batting in England innings, although he made just two and the match was abandoned due to rain. In the second Test against Pakistan, he took 2–43 in Pakistan’s first innings before taking 3–88 in their second as England won by 330 runs to level the series at 1–1. In the third match he made 63 with the bat in England’s first innings as they reached 297. He did not pick up a wicket in Pakistan’s second innings but made an unbeaten 86 in England’s second innings to help them turn the game around and secure an unlikely victory. In the final match of the series he made 108 in England’s first innings but could only manage 2–128 with the ball. Pakistan went on to win the match by ten wickets to level the series at 2–2. In the first ODI Ali took figures of 1–30 as England won by 44 runs on the D/L Method. He did not take a wicket in the second ODI but scored an unbeaten 21 to help England win by four wickets. He took one wicket in the third match of the series, which England won by 169 runs. In the fourth match he took figures of 2–39 and scored an unbeaten 45 as England went 4–0. He was rested for the final match of the series, which England lost, but played in the only T20I between the two sides, taking figures of −24 after scoring an unbeaten 13, but England lost by nine wickets. Ali made 6 in the first ODI against Bangladesh, and failed to pick up a wicket, although England won the game. He made 4 in the second match as England lost by 34 runs to leave the series at 1–1. Ali took 1–42 in the third ODI but made just one with the bat. England won the game by four wickets to win the series 2–1. Ali made 68 in England’s first innings of the first Test, and then took figures of 3–75. In the second innings, he made 14 before taking another two wickets to help England to victory. In the second Test, Ali took 5–57 to help to restrict Bangladesh to 220. Ali took just one wicket in the second innings and was out for a duck as England lost the match to draw the series 1–1. 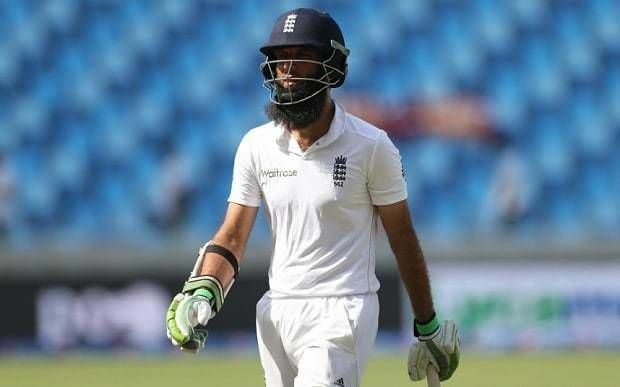 Especially in the English cricket team in Bangladesh in 2016–17 series, in the first test at Chittagong, Kumar Dharmasena judged that Moeen Ali was out on three occasions in the same test, also in the same innings, same session and also off the same bowler, Shakib Al Hasan and in the end Moeen Ali appealed against Dharmasena's all three decisions and survived (bottom edged,hitting outside Ali's leg stump and hitting outside his off stump respectively).This was the first time in cricketing history, that a batsman successfully managed to overturn the umpire's decisions for 3 times in a row in the same innings. In the first Test against India, Ali scored 117 in the first innings as England made 537. He took figures of 2–85 in India’s reply, and took 1–47 in India’s second innings as the match ended in a draw. In the second Test Ali took 3–98 in India’s first innings, although he only made one with the bat, and struggled again in England’s second innings as they lost by 246 runs. In the Third Test he made 16 in England’s first innings and took figures of 0–33. In the second innings he made just five and did not pick up a wicket as England suffered another defeat. In the fourth Test he made 50 with the bat, but took 2–174 with ball, before being dismissed for a duck in England’s second innings as they lost by an innings and 36 runs. In the final Test he made 146 with the bat in England’s first innings total of 477. He was out for 44 in England’s second innings as they lost by an innings and 75 runs to lose the series 4–0. Ali made 28 in the first ODI against India as England made 350/7, although they lost by seven wickets. In the second match, he took figures of 0–33 and made 55 as England lost by 15 runs. In the final match he made 2 and took figures of 0–41 as England won by five runs. In the first T20I ,he took figures of 2–21 as England won seven wickets. He took 1–20 in the second match as India narrowly won by 5 runs. In the third match, he took 0–30 and made two with the bat as India won by 75 runs to win the series 2–1. Ali played in the first ODI against the West Indies, and made an unbeaten 31 in the first game as England won by 45 runs. In the second game he took figures of 1–44 as West Indies were restricted to 225 as England secured a four wicket victory. In the final game he was out for a duck as England made 328, and then took figures of 0–27 as England won by 186 runs. In the third Test, Ali took a hat-trick to bowl South Africa out and end the match; it was the first hat-trick for an England spinner since 1938–39 and the first ever in a test match at The Oval. It is only the third time in Test history that victory has been sealed by a hat-trick, and the first time for 115 years, and also the first spinner to get a hat-trick at home, and the first hat-trick where three left-handed batsmen were featured (Dean Elgar, Morne Morkel and Kagiso Rabada). In the fourth Test, Ali reached 25 wickets and 250 runs in a series, the only player to ever achieve the feat in a 4 test match series. He then made a 75 not out in second innings of 4th test to help England to a strong position in the test. He then finished the game by getting a 5-wicket haul in two consecutive matches.